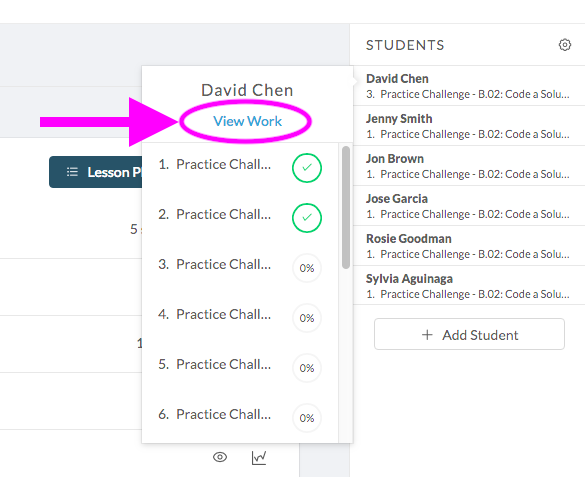 As students are working on coding challenges in their playlists, you can view their work right from your class dashboard. This is a great way to see what types of strategies students are using while coding, and to share individual students' code with the rest of the class. To view an individual student's work, simply click on their name in the right sidebar, then click View Work. Upon clicking View Work, the student's work will open in a new tab. For example, as illustrated in the image below, we can see the code that David has written so far for #3 Practice Challenge. NOTE #1: Although you will be viewing the student's work from your own computer, it's important to understand that this is a direct link to the student's actual work. That is, if you change their code from this view, you'll be tampering with the actual code that they are writing. NOTE #2: This view of student work will not update in real time; it will only show you the work that the student has completed up until the point that you clicked View Work. However, it will update if you refresh the page. If you click on the white Expand Playlist button in the top right corner of the screen, you can navigate to any challenge that the student has completed and see the code they wrote. David has been working on #3 Practice Challenge for a while, and it seems like he might be stuck. You click View Work to see the code that he's written so far, and you notice that he's missing a paint block at the end of his code (see image above). You decide to walk over to his desk and check in with him. After discussing some potential strategies with him, he realizes that he's missing a paint block. He fixes his code and successfully solves the challenge! You ask if you can share his solution with his fellow students, many of whom are also struggling, and he says yes. You go back to your computer and pull up David's work on the smart board, refreshing the page to show his now-completed code. Once everyone's paying attention, David comes up to the smart board and walks the class through his experience and his solution to the challenge. Another student raises their hand and says that they wrote different code that also solved the challenge. You go back to your class dashboard, click on the student's name and click View Work to bring up their code in a new tab. The class can see that they have indeed solved the challenge by using a different coding strategy. You explain that there are often many solutions to coding challenges, and the class gives a round of applause to the two students who shared.